Learn about what it means to be an Emergency Contact, how to designate one for yourself, and how to make sure these important people are accessible on your most important devices. Three years ago, my friend Loren died in a skiing accident. 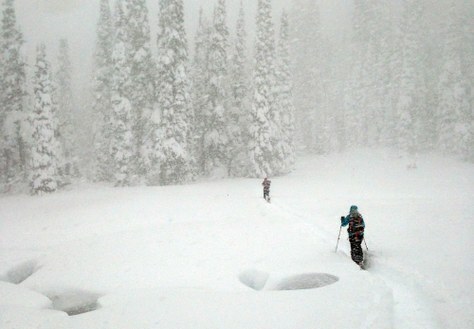 A huge February storm rolled through the Pacific Northwest, and a bunch of us took extra days off to go skiing. He and a friend were skiing Crystal in-bounds on a Wednesday when Loren fell into a tree well. He suffocated before he could be rescued. This experience was both shocking and heartbreaking. One of the worst parts, though, came hours after we were down from the mountain, when we were finally able to call his father to break the news. Loren had a passcode on his phone and we couldn't get in. None of us knew his family or emergency contact information. Only through Facebook and lots of difficult phone calls were we able to get to his dad. No one should have to wait 10 hours to get news like that. Within The Mountaineers, we are required to fill out a waiver to participate in our courses and activities. This includes a section for you to designate an emergency contact person, which is stored with your member profile. This is important from a legal standpoint and a practical one. If something were to happen on a Mountaineers trip, we need to know who to contact. This should be the person notified if you’ve been delayed or involved in an accident. You will often be asked by a trip leader to provide an emergency contact or to verify what’s online. Keep your personal emergency contact up to date. Generally people designate a spouse, family member, or another responsible party who can be in contact with family, friends, and any others with a stake in your well-being. Before you go out, provide your Personal Emergency Contact with basic trip details, the leader’s cell phone number, and how to contact the Team Emergency Contact if they’re concerned, or have news to relay onto others. The Team Emergency Contact is the party’s lifeline. They’re the primary emergency contact and central hub for communication. Some refer to this person as the Team Focal. This person owns the responsibility to escalate if the party is overdue, and they should be provided the full detailed trip plan and team roster. They should be given clear instructions on when to dial 911 or the appropriate party of jurisdiction if the party is overdue. They’ll be the primary hub of communication to the other Personal Emergency Contacts, and/or The Mountaineers Emergency Contact if something goes wrong. TRIP LEADERS – Designate a responsible person to be the Team Emergency Contact. Be clear and specific with instructions on when to call for help and how. Verify that they understand their responsibilities, and confirm their commitment to be available and responsive to any inbound calls or inquiries from the party or Personal Emergency Contacts. The Team Emergency Contact is your lifeline in the event of overdue delay or incident. This is a 24-hour hotline to The Mountaineers. If a major incident occurs, the club needs to be notified. If someone goes to the Emergency Room, SAR is dispatched, or a catastrophic incident on a Mountaineers trip occurs, notify The Mountaineers Emergency Line at 206-521-6030. Note: The Mountaineers Emergency Line is not set up to know if your party is overdue. However, it is manned 24x7. If you call and do not connect with a live person, leave a message with a brief description of the situation and a number to reach you. Someone will return the call within a few minutes. They will be able to provide guidance and next steps if needed. More detail may be found here. If you have a cell phone, chances are it comes with a program which allows you to give anyone access to specific information in the case of an emergency. You can enter things like your age, gender, weight, blood type, known medical conditions, and multiple emergency contact phone numbers. This information can be accessed even when the phone is locked. If you own an iPhone, simply Google “How to set up Medical ID” for instructions. For Androids and Windows Phones, look up “How To set up emergency contact information.” Or, find a detailed guide here. This article originally appeared in our spring 2017 issue of Mountaineer magazine. To view the original article in magazine form and read more stories from our publication, click here. I am sorry for the loss of a good friend. Of course our Mtrs trip leaders know to download the emergency contact info of the people on their trips. Lately I have mentored a few leads who did not have hard copy of the roster and emergency info with them- thinking they could access the roster on line (via phone) if needed. Since that may or may not be possible -- we can remind new leads to have the hard copy with them, and to leave it with the focal back home. Redundancy is useful in a critical system. Thanks for you condolences Margot. And good point - it's important to always have a hard copy of emergency contacts! The post seems to suggest that the team emergency contact should be at the center of the action, potentially fielding calls from multiple anxious and distressed emergency contacts in a fast changing and uncertain situation. Since many team emergency contacts will be spousal equivalents who do not necessarily know much about the activity involved, and don't know anyone on the roster, it seems that emergency management role should best be served by the Mountaineers emergency contact person. My approach has been to tell the team emergency contact specifically when and how to contact the Mountaineers emergency line if there is no contact from the party, meaning we are overdue. I presume the designated Mountaineers person on call should be able to take charge from there, including contacting designated emergency contacts of each team member. They should presumably have access to the trip roster, and be able to make judgments as to when to contact each participant's emergency contact. If I am incorrect in my assumption, I would be interested in hearing back from a club representative.